How do I book my child in for lessons? You can ring Turramurra Learn to Swim directly on 9489 4771 and book swimming lessons with our receptionist. Our receptionist will be able to determine the most appropriate class for your child based on their standard, age and previous experience. How do I confirm my child’s place? Full payment for a Term or Holiday booking is confirmation of your child’s class. What payment methods do you offer? We accept cash, cheque, Eftpos and credit card. We do not accept American Express, Diner’s Club or direct debit. Can I put my child on a Waiting List for lessons in the future? Yes. We will give you a call a few weeks prior to the commencement of the term you have chosen and let you know what spaces are available for your child’s swimming level. WHAT SHOULD MY CHILD WEAR TO THE LESSON? Babies and infants who are not toilet trained are required to wear a disposable swimming nappy e.g Huggies ‘Little Swimmers’ in the water. Normal disposable nappies or cloth nappies are not permitted as they compromise the pool’s filtration system. Children normally wear a swimming costume over the disposable swimming nappy with a rash shirt if desired. Please also remember to bring a swimming costume and towel for yourself if your little one is in the Water Baby class as adults are required to be in the water with their child at this swimming level. Preschool children are encouraged to wear firm fitting swimmers with elasticized legs. Board shorts should not be worn as they hinder leg movement. Many children require goggles to enjoy their swimming and goggles assist in developing the child’s confidence in putting his/her eyes under the water. A cap may be worn if needed for your child and goggles and caps can be purchased from reception. We provide back bubbles when required as a teaching aid during the lesson. DO YOU SELL SWIMMING ACCESSORIES? Yes. Goggles, caps, kickboards and back bubbles are sold in the reception area. What teaching aids do you use? At Turramurra Learn to Swim, we use back bubbles in the early stages to encourage correct body position, facilitate correct paddling and kicking techniques and increase the child’s independence in the water. The bubbles are designed with multiple layers that can be removed as the child increases in proficiency and strength. We also use noodles, a large rubber mat and kickboards to assist in teaching your child to swim. Bubbles allow the child to move naturally and give confidence as well as providing an element of safety when a child who cannot swim is part of a class without their parent in the water. We do not use or recommend the use of floaties when a child is learning to swim as it hinders their movement. What happens if I miss a lesson? We cannot guarantee a make-up class for missed lessons, however, we will do our best to accommodate make-up requests. Parents should phone Turramurra Learn to Swim on 9489 4771 in the morning of a day that suits you to see if there is an available space in an appropriate class for your child. The class can be made up any day, Monday to Saturday, pending availability. Make-up lessons must be used within the term of the missed lesson and they cannot be carried over into the next term. We do not give refunds for missed lessons. There is a $20 cancellation fee for all cancellations. Fees paid reserve your child’s place for a whole term or holiday course. If you cancel your child’s lessons we can credit the remainder of your fee towards the next term but we do not refund fees. There is a 50% discount for third and subsequent children within the same family for the same Term or Holiday Program. Can I claim swimming lessons through my Health Fund? Claims can be made through HCF and Bupa depending on your level of cover. If you are with a different fund, it would be worth making an enquiry of that health fund. What if my child is ill? Please avoid bringing your child to swimming lessons if he/she is showing signs of being ill such as a runny nose, fever or rash. These symptoms can indicate an illness that is contagious and could put other children at risk. Your child will only benefit from their swimming lesson if he/she is in good health. What if my child has an ongoing medical condition or special need? If your child has an ongoing medical condition or special need that we should be aware of, please let our receptionist know when booking your child in for a swimming program. During your child’s first lesson, we will also ask you to fill out an information sheet which will have space for you to provide these details. All such information is kept in strictest confidence. This information will enable us to provide the best teaching environment for your child. What is your child protection policy? 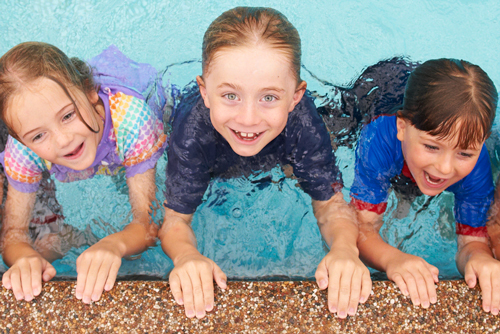 We are committed to ensuring that the safety, welfare and wellbeing of children are maintained at all times during their participation in activities run by Turramurra Learn to Swim. We aim to promote a safe environment for all children and to assist all staff, teachers and receptionists to recognise child abuse and neglect and follow the appropriate notification procedures when reporting alleged abuse. All staff undergo Working with Children Screening before employment. To read the full policy click here for Turramurra Learn to Swim Child Protection Policy. What qualification do your teachers have? All swimming teachers are qualified by AUSTSWIM and as part of this certification must annually update their CPR certificates. Their AUSTSWIM qualification must be renewed every three years giving evidence of Professional Development Hours and Practical Teaching Experience. As well as this our Swim School is also committed to providing ongoing training for all our swimming teachers. We recommend parking in the Council car park behind the Eastern Road shops. 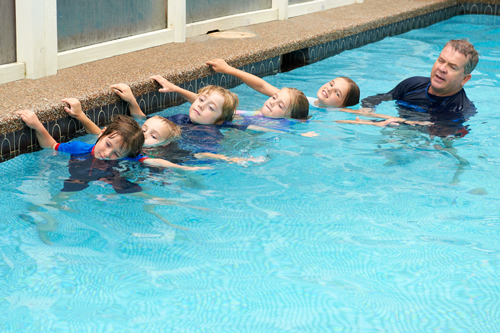 Turramurra Learn to Swim is easily accessible via our back gate. Alternatively, parking is also available on Tennyson Ave. See our Contact page for a map. WHERE CAN I PURCHASE A GREAT CUP OF COFFEE NEARBY? This is a question our mums often ask! Parker’s Nursery, opposite the Swim School, has a child friendly café which serves very good coffee and muffins etc. Other local shops around the corner include a butcher, pharmacy, green grocer, dry cleaner, bottle shop, BBQ chicken shop and IGA. Our parents often call into the shops after lessons to buy something for their dinner! “We are in our second generation now of attending Turramurra Learn to Swim and the results are the same! From six months of age to now – 2 and 4 year old confident swimmers. We have been blessed with professional and patient teachers, great fellow learners and a lovely atmosphere. The staff’s dedication to our children and their passion for pool safety has been an inspiration to us all – thank you!"